Founded by the Mt. 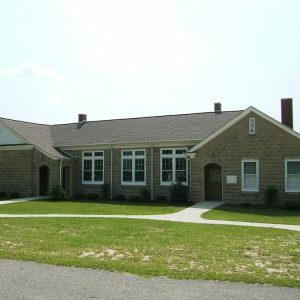 Canaan Educational Association, a cooperative venture of area Bapitst churches, Bettis Academy operated here from the early 1880s until 1952. The curriculum included the standard academic subjects as well as religion, teacher education, and vocational training. It eventually grew to a student body of more than 1000 and added a junior college on a 350-acre campus. It was forced to close in 1952 during South Carolina’s school equalization campaign. Today only three buildings remain—Alexander Bettis Community Library (1938), the Classroom Building (c. 1935), and Biddle Hall (1942)—and a large county park occupies part of the site.